H.D.P.E. 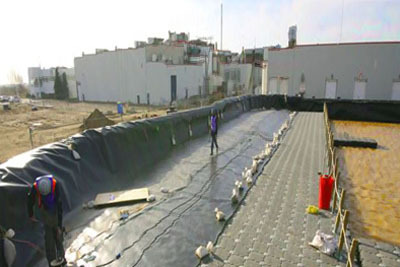 has become the most widely used geomembrane today – most commonly in landfill liner applications. Their exceptionally high chemical resistance, reliability in exposed environments due to their high UV and cold temperature resistance renders HDPE liners the logical choice in numerous waste containment applications. It is an extremely versatile material which is used widely across all applications and is an excellent choice for many secondary containments and virtually all water storage, including potable water, exposed canals and run-off ponds, settling ponds, and decorative ponds. In exposed applications HDPE geomembranes can last 20 years, in backfilled applications they will last hundreds of years.